Huawei’s new P30 Pro smartphone has jaw-dropping low-light abilities and industry-leading image quality. The company has been touting its quad camera system as being co-engineered by Leica, but here’s an interesting piece of info that isn’t being widely publicized: all the imaging sensors were made by Sony. EE Times just published a teardown of the P30 Pro in which they discovered the Sony origins of the sensors. “It’s a full design win for Sony,” analyst Stéphane Elisabeth of System Plus Consulting tells EE Times. The P30 Pro camera is unusual in that it uses an RYYB (Red, Yellow, Yellow, Blue) filter instead of an RGB filter to achieve better low-light performance (the equivalent of 40% more light, according to Huawei). It’s also the first smartphone to use Sony’s Time-of-Light (ToF) camera for autofocusing purposes. The Huawei P30 Pro has shattered the ceiling when it comes to industry camera sensors tests. Over at DxOMark, a test that has been gaining favor among smartphone makers in recent years, the P30 Pro took the #1 position with ease, beating the previous leader (Huawei’s P20 Pro of 2018) by three points. With a maximum ISO of 409600, the P30 Pro can capture usable photos in low-light environments where the human eye can pretty much only see darkness. What other smartphones on the market may capture (left) versus what the P30 Pro can capture (right). Photos by Huawei. 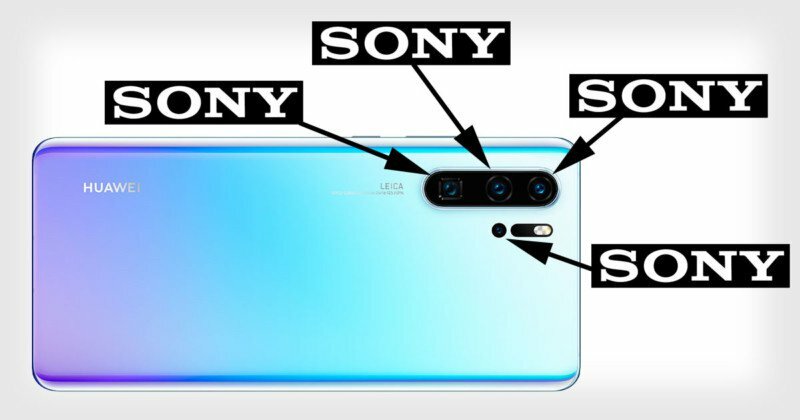 Sony recently revealed that internal politics and fears of self-cannibalization may have held Sony back from dominating smartphone photography with its own devices, but now the company’s Mobile smartphone team is collaborating more closely with the Alpha mirrorless team to make waves with future Sony smartphone cameras. And seeing how many Sony-made sensors are found at the top of DxOMark’s digital camera and smartphone leaderboards, Sony’s chances of succeeding at this mission look very good.